B4310LF-SSSD is rated 2.9 out of 5 by 13. 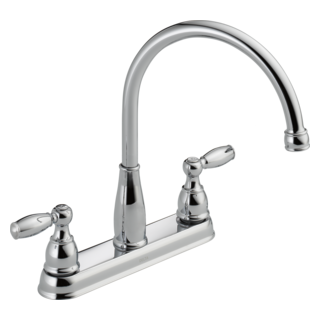 Rated 1 out of 5 by Martha3065 from Does not perform as expected Removed an old Delta faucet because it was leaking. Planned to fix it, but the copper lines twisted during removal. This faucet looked good. Hard to find one with separate sprayer, so this combo with soap dispenser fit my existing 2 hole sink. Install was quick and easy. Looks good. Performance is far less than expected. Copper lines seem to be 1/4" compared to the 3/8" of the old faucet. Pressure is terrible, on both settings. I am doubtful it could perform at the advertised 1.8 GPM. Worst part is, after installing the new faucet, it also leaks. So, I'll have to take it back out, fix it (a brand new faucet), and reinstall. 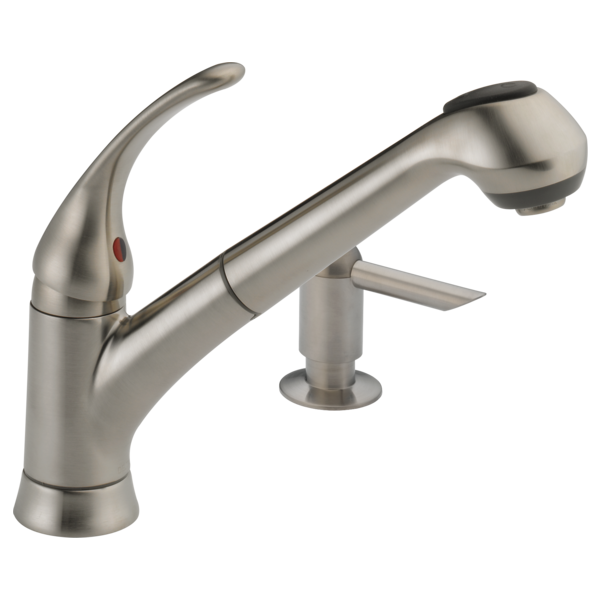 Rated 4 out of 5 by Ed1953 from OK faucet The faucet is OK, I would not replace with the same one again. One problem is the arerator. Mine has been plugged a few times and after cleaning it out I either lost a piece are could not figure out how to put it back together so it works like it did when new. 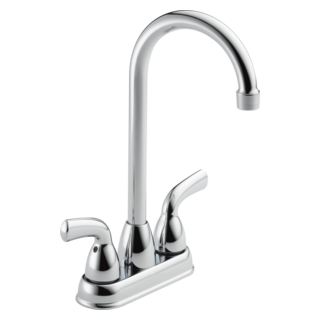 Rated 4 out of 5 by BC35 from Good product This is a very nice faucet that looks great. My only complaint with it is that the spray setting is not as powerful as my last faucet. 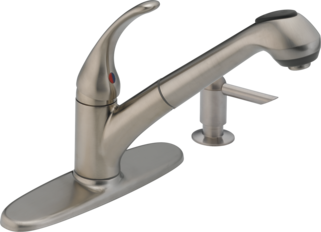 Rated 3 out of 5 by ReedMikel from Basic faucet, but water flow is low/restricted We got this faucet for free because our 1985 Delta kitchen faucet could not be repaired. That is an excellent warranty policy - to replace a failing faucet with a brand new one! I wish more companies operated like this... Overall this seems like a very basic faucet. The weight of the faucet is light, which makes it feel somewhat cheap. My main complaint is somewhat low water pressure. We have a well, where pressure can range from 20 to 60 psi. But even when our well is at the higher psi range, the water flow from this faucet is significantly less than our old Delta faucet. I guess it's a built in water conservation effort - which we'll just have to get used to. The built in spray head does not retract as smoothly as others we've owned, and the spray head itself has to be coaxed back into its resting place at base of faucet when done using the sprayer. It would have been nice if the end of the spray head hose could swivel where it attaches to spray head (sometimes spray head alignment tab does not line up with notch in faucet). Installation was straightforward and instructions very clear. Again, their customer service and warranty policy were excellent! We are not able to hook up our portable dishwasher to this faucet, Is there any part that we could get that would allow this?